The prep time actually varies a bit, depending on whether you bought your cauliflower pre-cut. If you have to cut up the cauliflower before you start cooking, allow another 5 minutes or so. 4 cups cauliflower florets Each one should be approx. the size of two baby carrots, if you put the baby carrots side-by-side. 1 cup panko breadcrumbs mixed with 1 teaspoon sea salt I would not use regular salt here. Sea salt grains are bigger, and they add a little extra crunch to the breading. Melt the vegan butter in a mug in the microwave, then whisk in the buffalo sauce. Holding by the stem, dip each floret in the butter/buffalo mixture, getting most of the floret coated in sauce. It's fine if a bit of the stem doesn't get saucy. Hold the floret over the mug until it pretty much stops dripping. A few drips are OK, but if it's raining sauce, your panko is going to get clumpy and stop sticking as well. Dredge the dipped floret in the panko/salt mixture, coating as much as you like, then place in the air fryer. No need to worry about a single layer. Just drop it in there. Air fry at 350F (do not preheat) for 14-17 minutes, shaking a few times, and checking their progress when you shake. Your cauliflower is done when the florets are a little bit browned. 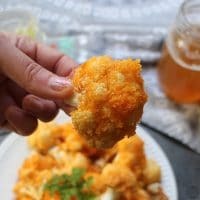 Buffalo cauliflower doesn't stay crunchy for long, so eat these immediately for maximum goodness. I'd recommend reheating these in the air fryer, so they'll get crunchy again. I gave some of these to my neighbor during testing, and he reheated them in the oven with good results, also. If you reheat in the microwave, they'll definitely be mushy.